Do you feel it, the restlessness inside of you? It is hard to describe but you know it is there. You wake up with it, and it goes with you to bed at night. A constant tugging inside, something has a grip on you and it won’t let go. Nothing seems to satisfy this hungry sensation, it’s only task is to devour your happiness and your ability to trust. You find yourself continually reminding yourself that everything is going to be ok. But there have been times when it hasn’t been fine, many an occasion have been spent feeling restless, but this time it feels different. The spiritual light inside of you feels oh so dim. What I am experiencing, I desperately need to know! 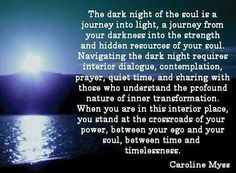 The Dark Night of the Soul is a process many spiritual seekers go through at some point their lives. A lot of times, we are told be happy, raise your vibration and experience the light of your being, but none of this will be lasting until you have experienced the dark. The Dark beautifully exposes our dying Ego, the pain and the agony is the breaking of our false self. This process will be one of the most loneliest times of your life. Do not resist the pain, let it flow out of you, it has been burdening you for nearly the whole of your lifetime. Since our ego selves do not really exist, the pain is only the conditioned stories that we have long been attached to. You are in a ‘spiritual depression’ but this is very different from clinical depression because the symptoms do not come from a certain external situation. You feel haunted because you have been surpassing emotions for far to long, gilt, shame, helplessness, anger, sadness, self-pity, these emotions are trying to get your attention, you must face them now. You will feel isolated, totally alone, there is no one else who can relate to what it is you feel. Know that you are helpless in this process and let that be ok, surrender to it and embrace love. Use your pain as a catalyst for the great transformation and rebirth that is happening within you. This will not last, you are in the process of setting yourself free, once and for all. Trust in this process and know that it is just that – a process. Just like Spring always comes after Winter, the days will become lighter and this too shall pass.